Yesterday, Thanksgiving Day, I decided to try a different recipe for cooking the big bird. Now, I know, as a cook, one should never try a new recipe on unsuspecting guests without having at least one trial run, but yesterday, I threw caution to the wind. 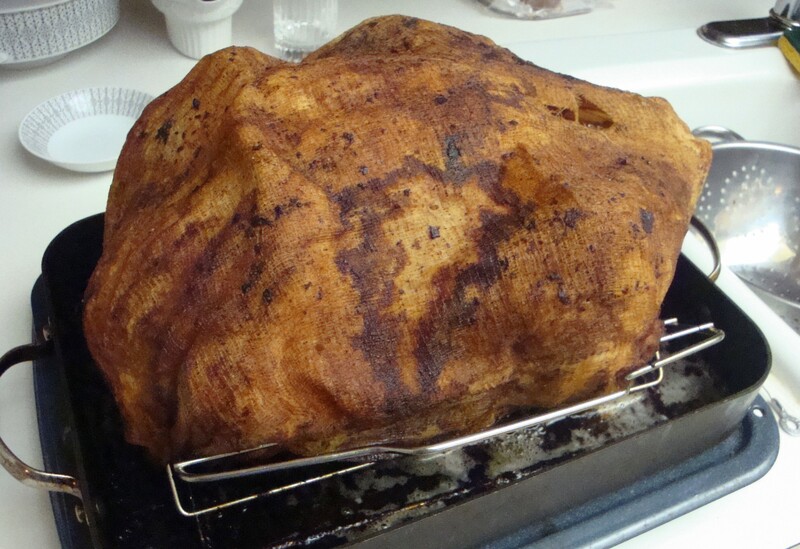 The recipe was “No Baste Holiday Turkey, Roasted with Cheesecloth Technique”, adapted from Michael Symon, with turkey stock, adapted from Guy Fieri. The recipe adaptation, which I found online, was adapted by Spinach Tiger (www.spinachtiger.com). At this point, you’re probably curious as to why I would be looking for a recipe online, when I have 3,752 cookbooks. The answer is simple. I saw the technique on a Food Network special recently and none of my current cookbooks, new or old, had a recipe for turkey roasted in cheesecloth. Paper bags, oven roasting plastic bags, clay pots, salt crust and more, but no recipe for cooking with cheesecloth. The recipe required that the turkey be salted liberally, wrapped in plastic and refrigerated overnight. Done. 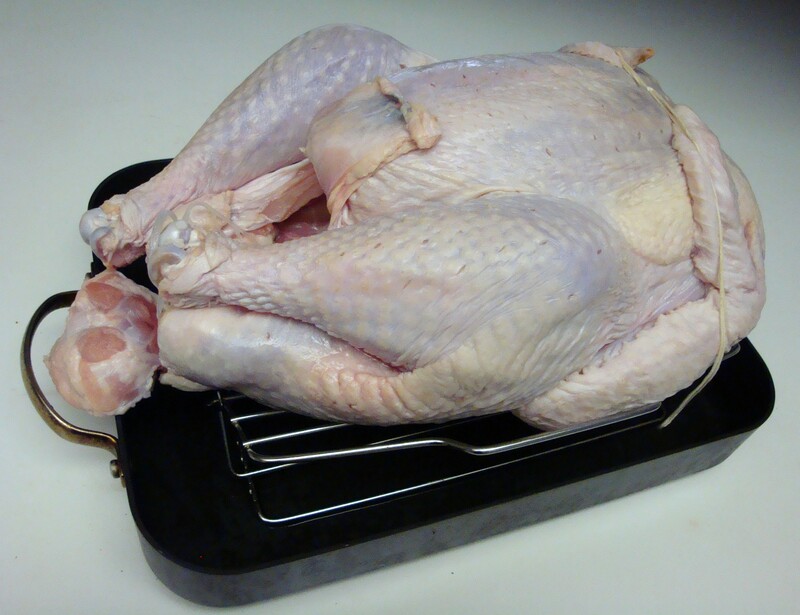 When ready to roast the turkey was removed, the salt washed off, patted dry and left to sit at room temperature for one hour. Done. When ready to cook, preheat the oven to 425 degrees, season with salt and pepper and stuff (I used my mother’s traditional stuffing recipe, and not the oranges, shallots and herbs the recipe suggested). 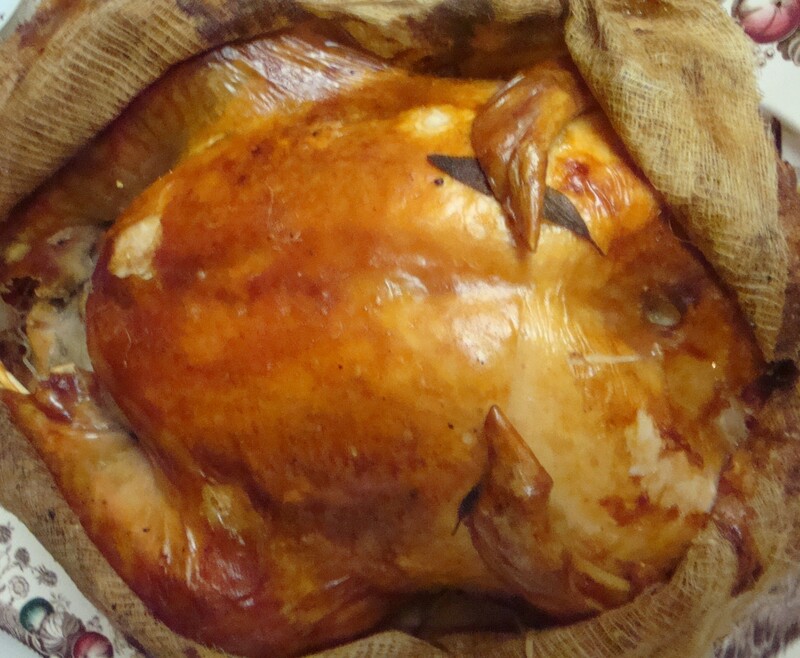 The turkey, enclosed in the ‘shroud’ of cheesecloth, and the stock poured over it. The turkey (they recommend 12 to 15 pounds, mine was 14.90 pounds) was placed on a rack in a roasting pan and 3 layers of cheesecloth were wrapped around it (“cover entire turkey with cheesecloth”). I did not wrap it around the entire turkey, only the top and sides and tucked it in around the rack, so no cheesecloth covered the bottom of the turkey. Turkey stock was then poured over the entire turkey. I had a small container of homemade stock, however, I also used a Sprouts Organic Chicken stock for the balance (32 ounces). Into the oven for 45 minutes. Done, however, in my convection oven, after 20 minutes the temperature had climbed too fast, so I turned the oven down to 325 degrees (not the 350 they recommended). Everything looked good. Although the recipe indicates that this is a “no-baste method”, I found that the stock evaporated very quickly (perhaps because of the convection oven), and twice, I had to open the oven and add more stock (I wanted enough stock for gravy). The recipe for making the stock is based on starting with 4 quarts of water and reducing the stock over a period of 2 hours. 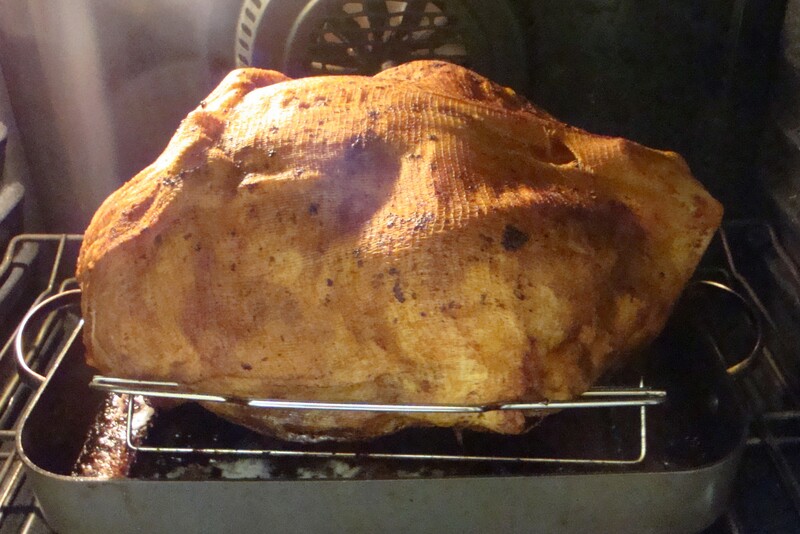 Shrouded turkey at about an hour and a half. Not much stock left, though. The final quantity is not specified, and after making my own stock for some time, I’m still not sure of how much stock results. I do know that the altitude in Albuquerque (my house is just at the mile high mark) affects the length of time, especially in boiling and baking. The turkey after about two and half hours. The ‘shroud’ is now shrinking and clinging to the turkey. 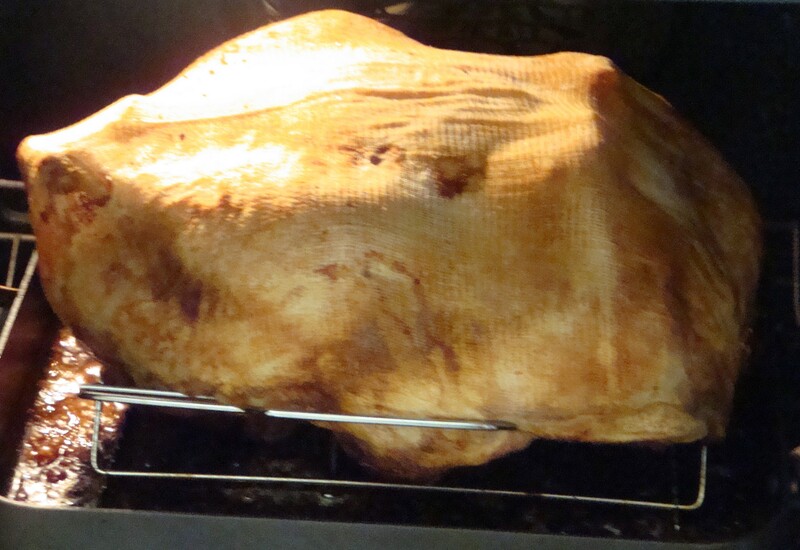 Shortly after 4:00 p.m., I took the turkey out and cut a small slit through the cheesecloth to have a peek. It seemed to be browning nicely. Back in the oven. Turkey, out of the oven just under four hours. Very toasty looking. 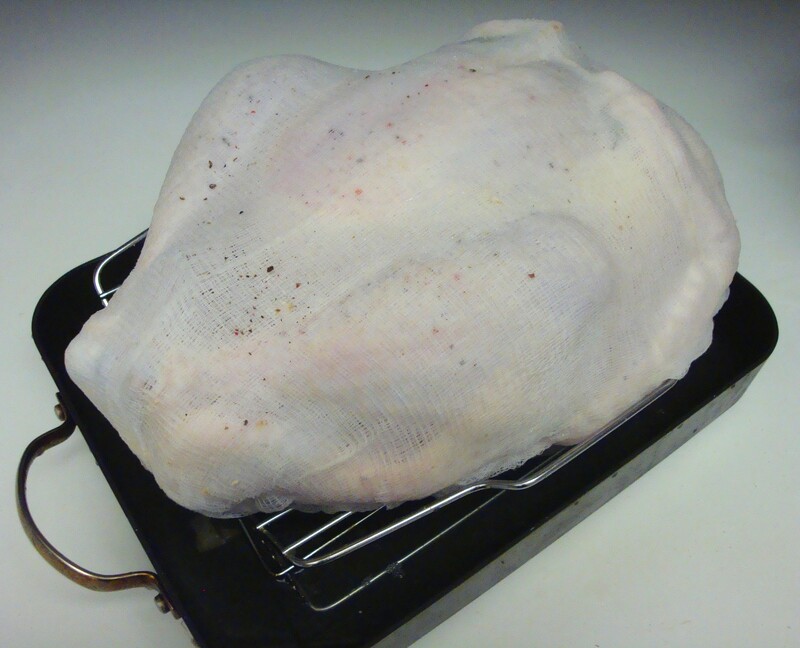 When I removed the turkey just before 5:30 p.m., it was time to remove the cheesecloth. At this point, I must tell you that with the dark, almost ochre/brown discoloration and the pattern of staining on the cheesecloth, it reminded me of the famous religious relic “The Shroud of Turin”, although it certainly didn’t resemble it by any means. (no insult intended to anyone’s religious sensibilities here at all, just an observation). Peeling back the “shroud”. 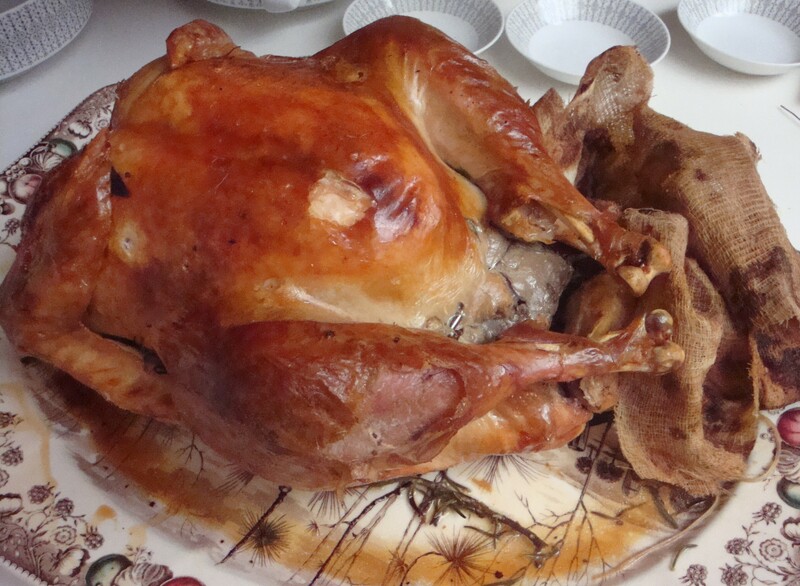 Looks golden brown, but lost a few pieces of skin and a few cheesecloth fibres stuck to the turkey. Removing the ‘shroud’ proved a little bit difficult, as there were several places, where the cheesecloth stuck fast to the skin and pulled it away, despite my attempts to be careful. In addition, there were numerous little fibres from the cheesecloth, that stuck to some areas of the skin, which I had to peel off with tweezers. Still, the turkey was golden brown and looked delicious. The “shroud” removed and ready to rest. As for the taste? It was good, a bit moist, but not significantly so, despite the recipe’s claim for the turkey to be “Perfectly moist”. Now, truthfully, I did not have a “Butterball” turkey, or a free-range turkey from my local butcher, just a plain Jane grocery store generic turkey, but still, it was pretty tasty. All in all, our guest was none the wiser for being a guinea pig for the cheesecloth technique. Would I do it again? Yes, but with the addition of more stock. So, today, it’s Happy Post-Thanksgiving Day and on to the leftovers! This entry was posted in Cookbooks, Cooking, Cooking Technology, Eating, Food Trends, Recipes and tagged Cheesecloth, cookbooks, Cooking, Food Photos, Guy Fieri, High Altitude, Michael Symon, Spinach Tiger, time capsules, Turkey. Bookmark the permalink.